‘Tis the season for parties, all kinds of parties from refined fancy dinners to energetic and crazy White Elephant gift exchanges. Getting together with friends, family, and loved ones is one of the best parts of the season. If you are hosting a party or two this year your goal most likely is to host a party where everyone is enjoying themselves, including you. Part of ensuring your guests are having a good time is creating a festive and inviting atmosphere and a tidy place to party foes a long way to create that. The first thing guests will want to do when coming through the door and out of the cold is remove their coats and set down their bags. If you have shoes and jackets filling up your entry or mudroom space, consider relocating them to another place in the house like a room that will not be used. This will free up your coat hangers for your guests and they will always know how to access their belongings should they need to access them or scoot out early instead of asking where their coat is in the middle of the party. If you plan to have a sit-down dinner make sure that you have a seat and space at the table for every guest and be prepared for a few more. Maybe have a folding table and chairs at the ready and space to set it up along with an extra tablecloth and place settings so that it does not seem like the kiddy table or the unwanted guest table. If you are short some chairs or extra table space borrow the needed items from a friend or neighbor. If you plan to have a buffet and guests are bringing dishes to share have a buffet table set up and ready to go with plenty of room for everyone to display their food. This probably goes without saying, but a tidy and clean house is a comfy and stress-free house. Not only does a clean space provide a comfortable and inviting space for your guests to hang out in, it relieves stress off of the hosts as well. When your home is in its best condition you will not have that nagging feeling of worry that your guests are noticing that your home is dirty. Relieve some of the cleaning stress by hiring a professional. This is a great time for carpet, upholstery, tile, and stone cleaning. Have a sealant applied after your cleaning to help make cleaning up accidental spills and after the party easier. It is highly likely for an accidental spill or two to happen during a holiday party. The best way to ensure successful stain removal is to clean them up right away. Have a basket of stain fighting treatments at the ready to enable you to get to spills even quicker. Some great items to have on hand are plain white cloths/rags or paper towels, hand dish soap, white vinegar, and a spray bottle. Though most of your guests time will not be spent in there, your bathrooms WILL get used. Give all surfaces of bathrooms you plan to let guests use a quick wipe down, stock plenty of extra toilet paper, make sure there is plenty of soap and maybe a hand sanitizer (should the soap run out), and place a new air freshener or light a great smelling candle. A fresh scent goes a long way to create an inviting space. 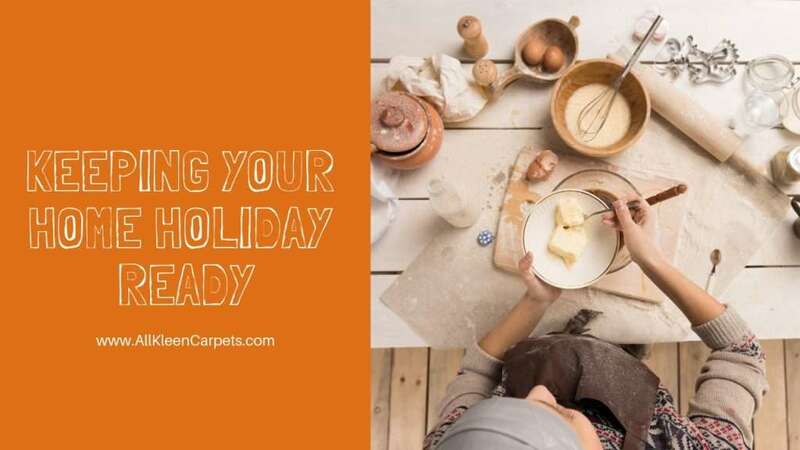 Want some reliable professional help to get your home ready for hosting holiday parties? All Kleen provides hardwood cleaning in Snohomish and surrounding areas as well as tile, stone, carpet, upholstery and stain removal. Make an appointment online or give us a call.